The 3M Proflow SC Asbestos used in asbestos removal operations is a powered air purifying respirator. The CE-certified system incorporates two P3 high-efficiency particle filters and a full-face mask approved by class TM3. The system meets with all European and national requirements used by asbestos workers for respirators. Incorporating a downloadable data-logging function Proflow SC Asbestos automatically records usage and performance information making record keeping much easier. The same electronics allow the Scott approved service center to run diagnostic checks and provide a full service history record. 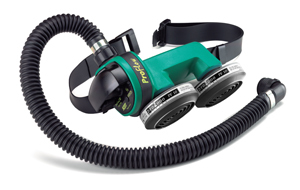 The Proflow SC Asbestos by 3M is electronically advanced with powered air respirator. The high performance motor electronically maintains a steady 160 l/min airflow, ensuring user comfort and long use duration. The unit provides continuous visible monitoring of battery status and filter blockage, with audible alarm in case of low battery or filter clogging to ensure the user is protected at all times. The NiMH high power battery provides typical 10 hour use from a single charge and fast recharge times. Supported by Scott, the Proflow SC Asbestos is a low maintenance unit, with service requirements undertaken by the trusted network of Scott Authorized Service Centers. Proflow SC Asbestos also has an integrated data-logging functionality which can be used to monitor performance data, diagnostic checking and service history via the Service Centre Network. High performance filtration of the Proflow SC Asbestos utilizes the proven Pro2000 filter range. Developed in the 3M Filtration Centre of Excellence, the Pro2000 filters are produced in a technologically advanced robotics unit, to ensure filters are of the highest specification possible. Supported by the Scott Research and Development Unit, 3M filters undergo rigorous testing and improvement programs. The water ingress resistant Proflow SC Asbestos has been designed to provide improved protection from water ingress, increasing the ease of decontamination. The blower unit has a shower proof construction with improved seal efficiency between the blower and motor clamp. The air outlet area can be sealed with a hose attachment adaptor to ensure the unit at all times is not contaminated when the hose is not connected.